This project is an SDK for reading, writing and validating ABA/Cemtext files. The ABA format, which I first introduced in this article, is a de facto standard used by Australian banks and other financial institutions, which allows users to perform bulk payments. I received a lot of interest in my original article, so I decided to create an object model for working with these files in .NET, as well as providing a mechanism to validate them. AbaFile – Container for ABA records. Reads, writes and validates ABA files. 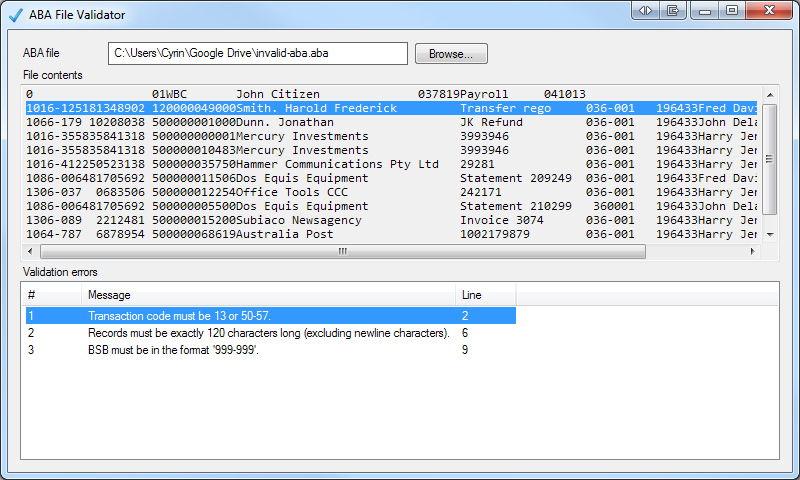 Record – Abstract base class for records in ABA files. DescriptiveRecord – Type “0” records. DetailRecord – Type “1” records. FileTotalRecord – Type “7” records. Validator – Holds the results after validating an ABA file. ValidationError – Describes each error in an ABA file. It also comes with a sample application for validating ABA files. 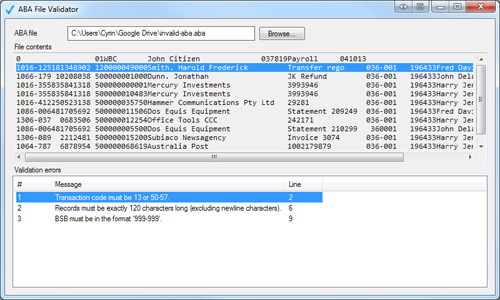 This application displays the contents of the ABA file and lists the validation errors, if any. Double-clicking an error highlights the affected line. The AbaValidator.dll assembly is written in C#, but can be referenced in other .NET projects. It is not tied to any particular presentation framework, so you are free to use it for WinForms, WPF, ASP.NET and other project types. Note: The source code can be easily adapted to earlier versions of the framework and versions of Visual Studio. Fixed an issue where an exception would be thrown while validating an ABA file if the number of detail records did not match the count. Very useful. Thanks Brad. This is an excellent resource. Slight bug in your validation of the File Total record BSB. It always reports the format for the BSB is incorrect as it’s comparing to the literal “999-999” – so only a BSB of 999-999 passes validation. Thanks for letting me know, i’ll update the source code. This is not a bug. The field can’t be anything but 999-999. Original code was/is correct.